What if you had access to a product that had a strong potential to help you fight the onset of cancer or arrest the growth of established malignancies? What if evidence showed it could potentially forestall the aging process and keep your mind sharp well into old age? What if the same substance contained chemical compounds that could lower your risk of heart attack? Wouldn’t you eagerly travel far and wide to locate such and important piece of the health puzzle? There is no need to search exotic locals for a mysterious herb or ask for a wonder drug at your pharmacy. Look no further than your corner grocery store or your back field for this miracle food – it’s berries. The same berries you’re used to seeing in your morning muffin or in the slice of pie at dinner are capable of providing nutrients that can improve your health and the quality of your life for years to come. Nutraceutical products may range from isolated nutrients and dietary supplements, such as vitamins and herbs, to genetically engineered “designer” foods, and include herbal products and processed foods such as energy bars and juices. Nutraceuticals also include whole foods such as fruits and vegetables that contain naturally occurring phytochemicals. From the Greek root “phyto” meaning plant, phytochemicals are nonnutrative chemicals found in edible fruits and vegetables that promote health and prevent chronic disease. Phytochemicals are used by plants as a defense against pests and adverse growing conditions. Research now suggests that these same substances which protect plants may benefit humans, protecting them from chronic diseases such as heart disease, cancer, diabetes, and hypertension, forestalling mental aging and perhaps fighting Alzheimer’s Disease. One class of phytochemicals is phenolic compounds. Two main classes of dietary phenolics are flavonoids and phenolic acids. Anthocyanins are part of the flavonoid family; they give blackberries their characteristic blue color. The antioxidant characteristics of fruits appear to be due largely to the anthocyanins. The darker, more deeply red and blue colored fruit, usually have the highest antioxident values. We have all heard about the importance of antioxidants in forestalling the aging process. Just as your metal saw left out in the elements rusts due to oxidation, your body deteriorates due to the effects of oxidation. Antioxidents fight the process of aging by fighting off the diseases associated with old age. Antioxidants neutralize free radicals, which can damage DNA molecules and lead to cancer. They also counteract environmental carcinogens, protect against cardiovascular disease, fight sun damage to skin and may thwart the effects of Alzheimer’s and other age related disorders. Blackberries and raspberries are among the top ten foods containing the highest antioxidant levels. Eating even modest amounts of these berries, just one cup a day, can provide your body with the highest daily intake of antioxidants recommended by authorities. Antioxidant levels are measured in ORAC numbers. Studies by Dr. Jim Joseph, at the Jean Mayer USDA Human Nutrition Research Center on Aging at Tufts University in Boston, suggest that consuming fruits and vegetables with a high ORAC value may slow the aging process in both body and brain. ORAC, short for Oxygen Radical Absorbance Capacity, is a measure of the ability of foods, blood plasma and just about any substance to “sponge up” oxygen free radicals. Oxygen free radicals are the harmful by products formed through the body’s metabolism, free radicals damage cells and initiate carcinogenesis, which is the development of cancerous cells. Research has shown that antioxidants work best when combined and that the presence of fiber and other plant compounds may provide additional health benefits. Consequently it is recommended that you get most of your antioxidants from your diet rather than relying on supplements. Measured in ORAC units, blackberries have 2400 units per 100 grams, raspberries 1220, and blueberries 2400 . Compare these numbers with the much touted antioxidant abilities of broccoli at 980 and you’ll find that berries carry their own sweet rewards. Berries are extremely high in another phenolic compound, ellagic acid. Ellagic acid is a phenolic acid phytochemical. It works as a potent anti-carcinogen by binding cancer-causing chemicals found in the body and making them inactive. Ellagic acid is found in many fruits and vegetables, but levels are about five or six times higher in raspberries and blackberries than those in apples, pears and plums. Ellagic acid may well provide yet another piece of the anti-aging puzzle. Research by Dr. Daniel Nixon, president of the American Health Foundation at the Hollings Cancer Center of South Carolina, indicates that the ellagic acid in red raspberries may prevent several types of cancer by inhibiting the development of cancer cells, and arresting the growth of cancer in persons with a genetic predisposition for the disease. In a 30 week study, rats fed a diet consisting of 5% whole freeze dried raspberries had 39% fewer tumors than rats not fed the berries, while those fed a 10% raspberry diet had 49% fewer tumors. Tests indicate that ellagic acid is specifically effective on colon, cervical, breast and pancreatic cancer cells. Studies on ellagic acid indicate it may prevent cancer growth and may halt the development of pre-invasive cancerous growths. Cancers take years, even decades to go from normal to invasive cell growth. Dr. Nixon estimates that 20 million Americans are in this gap area, between normal cell growth and cancer. Using the results of this research each of us can make an informed choice to eat more of the types of food shown to be beneficial to health, and lessen our chances of proceeding from this gap area to advanced stages of disease. Statistics show that Americans consume less fruits and vegetables than are recommended for overall health. Armed with the knowledge that certain foods provide more advantage to our health than others do, we can protect our bodies through sensible eating. Fresh vs. Processed Berries: Is There a Nutritional Difference? While fresh berries are delicious, consumers have access to them only 2 months of the year. Fortunately, berries are available year round in many forms, including IQF (individually quickfrozen), pureed, canned and dried. You may ask if processing such as cooking or freezing berries affect the phytochemical properties they contain. The answer is a resounding no! 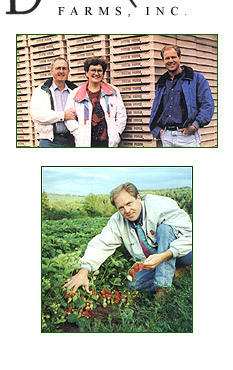 Dr. Jim Joseph, of Tufts University conducted studies to determine the effects of storage time and temperature on the anthocyanins, phenolics and vitamin C content and ORAC of strawberries, raspberries, and blueberries. Results indicate that with ambient or slightly higher than ambient temperature, the phenolic and anthocyanin content of raspberries increased when stored at 0 degrees. In addition the ORAC value of berries also increased. In laymen’s terms, you can freeze them, cook them or dry them and berries retain or increase many of the nutritional and phytochemical properties that they have when fresh. All of the interest in nutraceuticals on the part of scientists, health professionals and consumers largely stems from U.S. health statistics. The fact is, what we eat is implicated in six of the ten leading causes of death in the United States. (Heart disease, cancer, stroke, diabetes, atherosclerosis, and liver disease) . Nutritionists have long believed that a diet high in fruits and vegetables, whole grains and legumes protects against disease and enhances overall health. The recent discovery and identification of phytochemicals in fruits and vegetables statistically supports this belief. Although there is active research focusing on isolating the specific components of these phytochemicals, it is important to remember that it may not be a single ingredient but rather a combination of phytochemicals that give this health benefit. Eating the whole fruit will guarantee that you will miss none of the protection that these whole foods offer. As scientists continue to study the links between what we eat and our health, they are documenting berries as one of the most significant foods for improving and maintaining a strong body. Sweet and succulent, one cup or more of berries can be a joyful addition into our daily diet. A few berries in yogurt, or a muffin, or perhaps a berry smoothie will provide your daily amount of anti oxidants and satisfy your sweet tooth. By eating the whole berry you guarantee that you will be getting all the ellagic acid, anthocyanins and vitamin C you need, combined with the fiber and other nutrients that will enable these phytochemicals to do their work. And most importantly, while you are fueling your body and protecting against disease, you will be enjoying a natural and delicious treat.